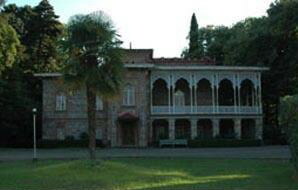 Tsinandali, one of the most remarkable country estates in Kakheti, Georgia. Tsinandali refers to four different phenomena: the Estate of Tsinandali, the village of Tsinandali, the Chavchavadze's summer home, and several vintages of white wine. Initially built during the 19th Century, the house, winery and gardens tell the story of a fascinating family: The Chavchavadzes. Tsinandali complex occupies 20 Hectares, there you can find different kind of facilities. Among of them are important the following ones: Museum building (total amount of space 700 m2. meters. Exhibit spaces are 3, with total amount of 307 m2. ; first room: 62 m2., second room 65 m2., third_180m2. ) Old Vinery, where are held different kind of events, with total exhibit space amount of 908 m2 and the hotel there is extra exhibit space of 120 m2. The main partner of Chavadzes Museum in Tsinandali is Silk Road.